Ganesh Chaturthi falling on 13th September 2018 Thursday celebrates the birth of the elephant-headed God Ganesha. Ganesha is the lord of wisdom, knowledge, prosperity and good fortune. Maa Parvati created him with sandalwood pate in the absence of Lord Shiva to guard her while she went to have bath. Suddenly, Lord Shiva came and Ganesha didn’t allow him to enter as per her mother Parvati’s orders. This led Shiva to get into a fight with Lord Ganesha. Furious Shiva cut off Ganesha’s head in anger. When parvati saw this, she threatened Shiva to destroy the world. Then Shiva immediately ordered his followers to find and bring a child whose mother has her back towards him in negligence. The first child seen by the followers was that of an elephant. They as ordered cut his head and brought it to Lord Shiva. Shiva placed the head on Ganesha’s body and brought it to life again. This calmed the rage of Goddess Parvati and all the Gods blessed Ganesha. Since then the day is celebrated as Ganesh Chaturthi. The celebration lasts for 10 days. On the first day, a clay idol of Lord Ganesha is installed in homes or in localities’ pandals. The idol is given a bath with pure water. Then it is decorated with colourful aromatic flowers. Various bhajans and mantras are chanted with full devotion. Friends and families gather together to celebrate the festival with great pomp and show. Locality pandals also witness the visit of a large number of devotees. People exhibit their joy and enthusiasm in the form of singing and dancing in front of the idol. The idol is finally immersed in a river or sea after the festival is over. Although, a large variety of bhogs is offered to Lord Ganesha during the festivity laddoos are known to be the Ganesha’s favourite sweet. Ganesha loves steamed modaks the most. So, he is also known as “Modak Priya”. Modaks are sweet rice flour dumplings filled with coconut and jiggery. 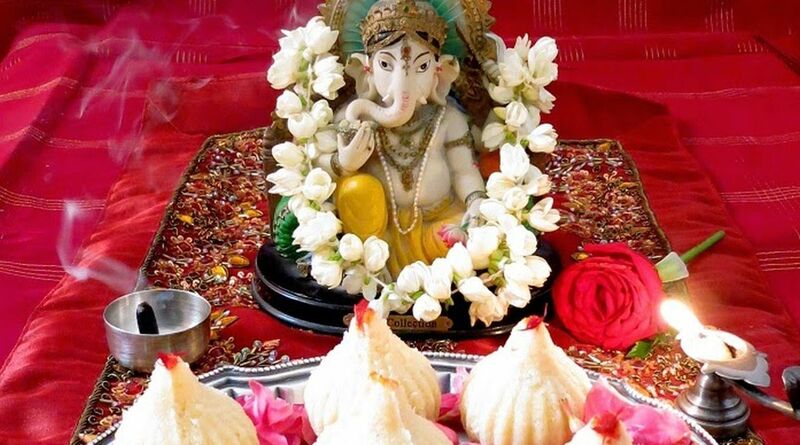 It is a ritual sweet dish specially prepared on the day of Ganesh Chaturthi to offer to Ganapati Bappa. First make the sweet stuffing. Take one cup fresh grated coconut in a pan. Turn the heat on medium. Add one cup jiggery, mix well. Jiggery will start to melt. Cook for couple of minutes stirring it continuously. Then add half teaspoon green cardamom powder, two teaspoon each of poppy seeds, raisins and chopped cashews. Mix well and cook till moisture is evaporated. Let it cool. Now make the dough – take one cup of water in a saucepan. Add pinch of salt and two tablespoons of pure ghee. Turn the heat on medium low. Let it come to a boil. Add one cup rice flour. Start stirring immediately making sure there are no lumps. Cover with lid and cook for two to three minutes. Stir occasionally in between. Remove it to a flat plate and let it cool. Once it is little warm, knead it properly to make a lump-free soft and smooth dough. Make small balls out of this dough. Grease the modak moulds. Press the balls tightly into the moulds and make the hollow at the centre using your finger. Scoop two teaspoons of sweet dry fruit stuffing and fill the hollow space pressing it lightly. Now start creating the pleats with your index finger and thumb. Get the pleats together to form a bundle. Close the top by pinching and making it pointed. Don’t want to settle for store-bought motichoor laddoos on Ganesh Chaturthi? 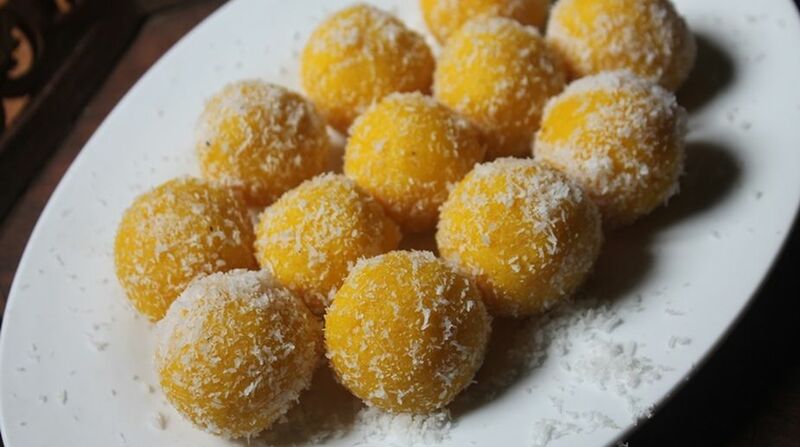 This recipe will have your favourite laddoos ready for bhog in your kitchen only. Make sugar syrup heating four cups of water and three cups of sugar together in a large deep pan. Bring to a boil and stir until sugar is fully dissolved. Add one-fourth cup of milk and simmer for five minutes. While boiling if scum appears, remove it. Boil until the solution reaches one string consistency. Add one teaspoon of green cardamom powder and half teaspoon of edible orange food colour. Stir well and keep aside. Now, in a large bowl mix two cups of besan with half litre milk until smooth. Add a pinch of baking soda and mix well. Heat pure ghee in a deep pan for deep frying. Place a perforated ladle on top of the heated ghee and add some batter into it. Allow the batter droplets fall into the hot oil and cook until golden. Take them out from the ghee on a tissue to remove excess ghee. Mix the boondis well in sugar syrup. Allow them to cool slightly. Shape them in small round balls. Garnish with a sliced pistachio on the top. Offer this amazing sweet to Lord Ganesha and get his choicest blessings. 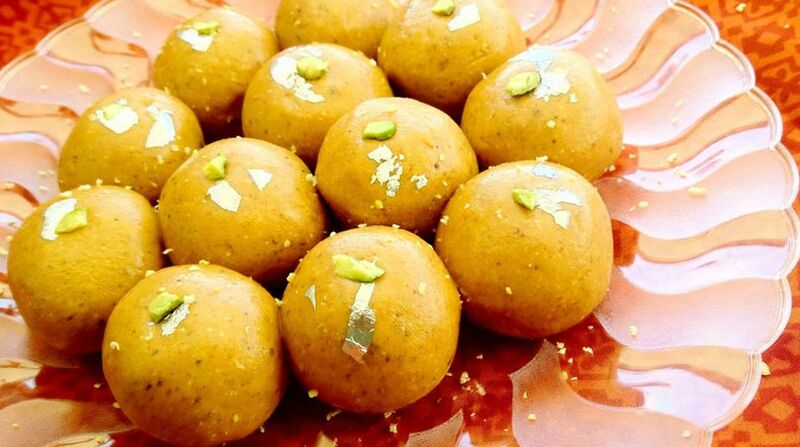 These tasty laddoos are made with mawa (khoya-evaporated milk), sugar and cardamom powder. Heat a pan and keep the flame low. Crumble or grate 250 grams mawa and put it in the heated pan. Keep stirring on low flame for a minute. When the mawa begins to melt, add half cup sugar and stir for a minute. Once the mixture starts bubbling, sprinkle one-fourth teaspoon green cardamom powder. Keep stirring until the mixture starts leaving the edges of the pan. Don’t overcook. Let the mixture to cool. Knead the dough gently while it is slightly warm. 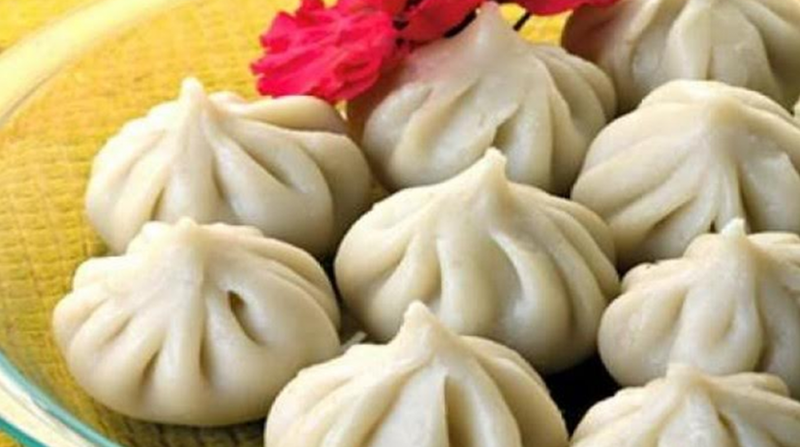 Grease the modak moulds and place modak balls one by one pressing them so that they take the shape of the moulds perfectly. Gently unmould. Mawa modaks are ready for Lord Ganesha’s bhog. Atta laddoo is a sweet rich mithai which can be prepared while celebrating Vinayak Chaturthi. Place a thick bottomed deep pan on flame. Pour two-third cup pure ghee and one cup wheat flour in it. Roast it on medium low flame till its colour changes to golden brown and it turns out to be fragrant. Keep stirring while roasting. Turn off the flame. Add one tablespoon of chopped cashews, almonds and pistachios each. Add 20 to 30 raisins and one-third teaspoon green cardamom powder. Mix all ingredients well. Transfer the mixture in a big plate. Let it cool. When the mixture is slightly warm, add one cup karara (a kind of powdered sugar). Make round laddoos using your palms when it is little warm. 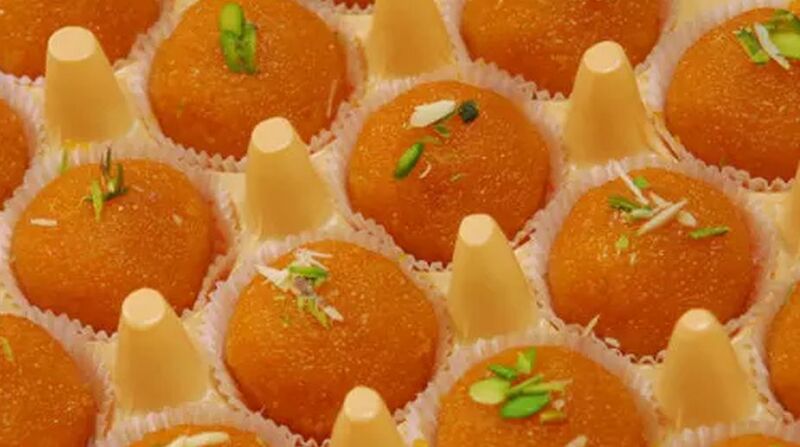 Besan laddoos are one of the popular laddoos often made during festive occasions like Ganesh Chaurthi. Roast one cup besan in two-third cup ghee on low flame till it starts giving a nutty fragrance. Keep stirring the laddoo mixture while it is on flame. Add one tablespoon of chopped almonds, cashews and pistachios each and 20 to 30 raisins. Mix well and turn off the flame. Transfer the mixture in a big plate and let it cool. When the mixture is slightly warm, add one cup karara (a kind of powdered sugar). Mix well and make small round balls out of the mixture. Garnish with a pistachio on the top, placing and gently pressing it. Ganesh Chaturthi is an important festival of India celebrated with great zeal in most parts of the country especially in Maharashtra. 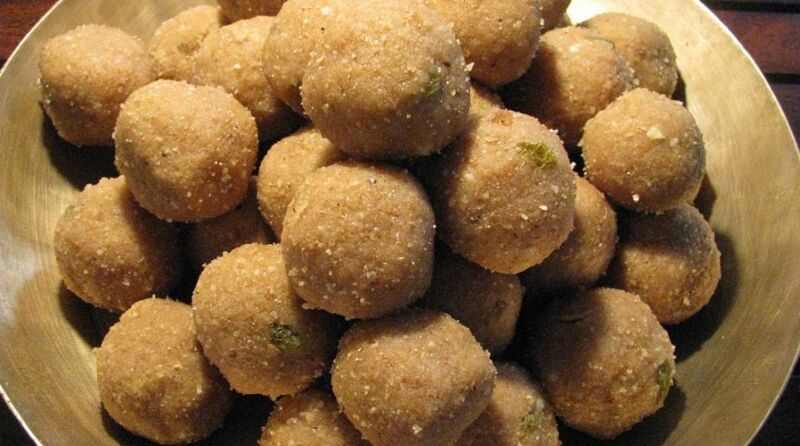 Modaks and laddoos are an integral part of the festival being the most favourite sweet of Gajanan. Make sure to try these recipes during Ganesh Chaturthi merriment and seek blessings of the supreme power of luck. Aapko aur aapke parivaar ko Ganesh Chaturthi ki haardik shubhkamnayein!